I’ve never really had cause to use Matplotlib before so over the weekend I took a quick look at it and how useful it actually is for creating quick graphs. 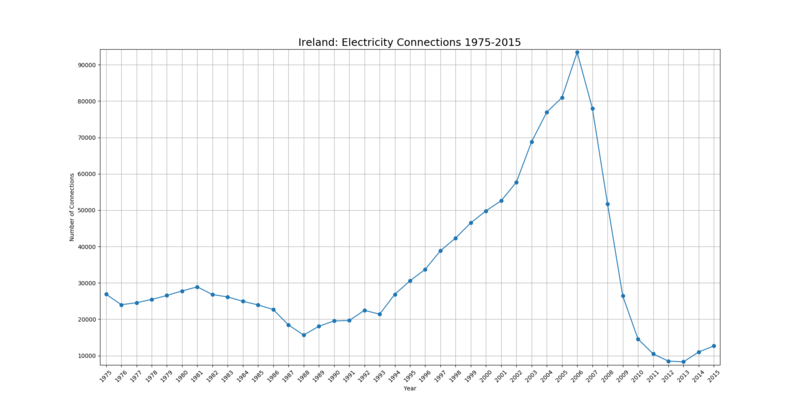 I took the electricity connections dataset (used as a measure of new homes built, however rough) and created a simple line graph. Below is the code I used and the result. The main strength I’ve seen from it is that it is very easily customisable as well as being a nice addition at various stages of a complex python script in order to error check a methodology in train. Posted on 19/02/2018 15/04/2019 by Dónal	This entry was posted in Python. Bookmark the permalink.